Throughout this year, when the several dozen members of the House Freedom Caucus clashed repeatedly with the House GOP leadership, they defended themselves by saying they were only doing what their voters back home wanted. Clearly some individual constituents approve of the Freedom Caucus’ hard-line stance. But a new Pew Research Center survey analysis finds that the attitudes of Republicans living in Freedom Caucus members’ districts look very similar to those in other Republican-represented districts, and that the overall demographics of Freedom Caucus districts and other GOP-held districts are similar as well. 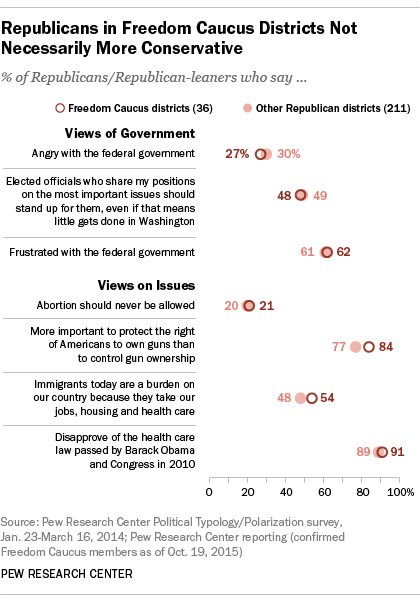 Both groups expressed similar levels of disaffection with the federal government and its leaders: About three-fifths described themselves as frustrated with the federal government; 27% of Republicans in Freedom Caucus districts described themselves as angry, statistically indistinguishable from the 30% of Republicans in non-Freedom Caucus districts who chose that description. Republicans in Freedom Caucus districts were slightly more likely than Republicans in other GOP-held districts to hold an unfavorable opinion of Congress (83% versus 76%). Among both groups, however, at least eight-in-ten said most elected officials didn’t care what people like them thought. The Freedom Caucus has taken a hard stance on defunding Planned Parenthood, to the point of threatening to block a key spending bill over the issue. On abortion, identical shares (62%) of those in Freedom Caucus districts and other Republican districts said abortion should be illegal in all or most cases. On other hot-button issues, such as gun rights and Obamacare, the same pattern emerged: no statistically significant difference. About half of both groups agreed that “the growing number of newcomers from other countries threatens traditional American customs and values.” Republicans in Freedom Caucus districts were more likely than those in non-Freedom Caucus districts to call immigrants “a burden on our country” (54% versus 48%). 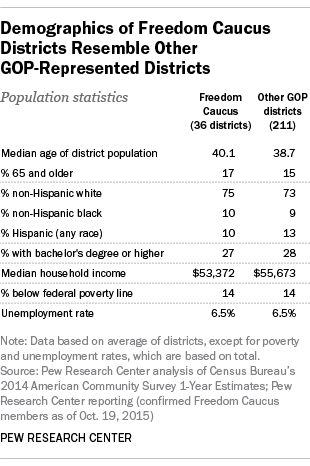 In terms of the demographic makeup of Freedom Caucus districts, there were few distinctions. 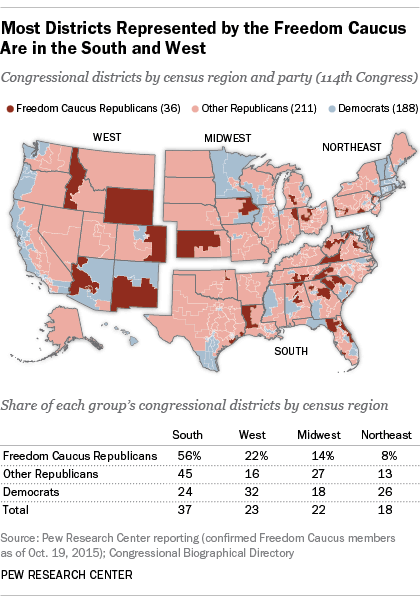 As a group, the 36 Freedom Caucus districts are a little older (median age 40.1) and a little whiter (75%) than the 211 other House GOP districts (median age 38.7 and 73% white). They’re a bit less highly educated (27% have a bachelor’s degree or higher, versus 28% in the non-Freedom Caucus districts), and their median household income ($53,372) is about 4% below that of other House GOP districts. Related: What is the House Freedom Caucus?